Your Miles can now get you more rewards with Giftaway! Giftaway is a new online redemption program that will allow the members to use their Miles to redeem items, foods or other goods from over 3,000 stores/establishments/restaurants nationwide. Members can also use their Miles to redeem gifts for their loved ones. 1. Who are qualified to redeem eGifts? 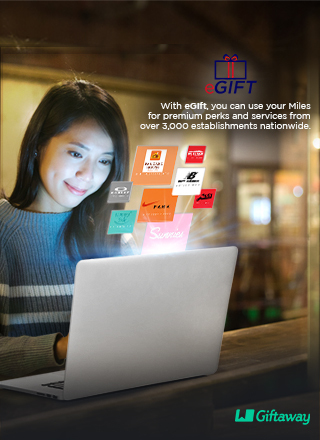 All Mabuhay Miles members are eligible to redeem an eGift. 2. How much Miles do I need to redeem? You can redeem an eGift for as low as 500 Miles. 3. Can I redeem with cash and Miles? Today, redemption can only be done using Miles. You can earn additional Miles by flying with Philippine Airlines and through our flight and non-flight partners. 4. How will the Miles be deducted? Your Miles will be automatically deducted based on the amount you avail. You can check actual deduction from your online account or through Mabuhay Miles mobile app. 5. Can I redeem an eGift for others? You can redeem for yourself and for others. 6. What are the other features of Giftaway? Giftaway allows the members to schedule the send-out date a month in advance from the date of redemption. For example, a member redeems on November 20, 2018, members can choose any date up to December 15, 2018 to send the eGift. It’s now easy to manage sending of gifts to your loved ones. 7. How would I know if I made a successful redemption? You will receive an email notification from Mabuhay Miles (email sender) and the eGift will be sent to the provided email address and/or mobile number. 8. Who do I contact if I did not receive the eGift? 9. Who do I contact when there is an error in the miles deducted in my account? 1. eGifts from this program have no expiration and can be used to pay for products/services at the chosen establishment. 2. eGifts cannot be exchanged cash or another eGift. 3. Miles deducted can no longer be credited back to member's Mabuhay Miles account. 4. eGift selection of establishments and denominations may change without prior notice. 5. Mabuhay Miles member is responsible for the safekeeping of his/her account password, eGift code, and other items related to this program. 6. Mabuhay Miles and Giftaway are not responsible for eGift stores that may have closed. 7. For Mabuhay Miles account concerns, please contact the Mabuhay Miles number at (+632) 855-8888 or email mabuhaymiles@philippineairlines.com for assistance. 9. Giftaway terms and conditions apply. 10. Mabuhay Miles Terms and Conditions apply.